In recent weeks, Khmer Times has published several opinion and editorial pieces on Cambodia’s present-day international relations challenges. Those authors were passionate in crying foul over the possible withdrawal of Cambodia’s Everything But Arms preferential treatment. They pointed out the EU’s double standards in comparison to Vietnam, Thailand, and Burma. They also claimed that the US was complicit in this act of “social injustice”, and that it is sowing distrust between Cambodia and other Asean countries. They rejected any US or EU criticism of human rights violations as interference in its affairs and proclaim that sovereignty and independence are paramount over EU demands. Yet, these authors have forgotten that since the EBA is a ‘gift’ from the EU to Cambodia, then they have the right to review, take it away or do anything they want with it. They are not obligated to ensure it is fair or not when compared to similar ‘gifts’ to other recipient countries. In business, each commercial contract with a client cannot be the same. Also, Cambodia has the right to give up the EBA if it thinks the conditions are too difficult and unfair as stated in some of Khmer Times’ editorials. But it chooses to cry and throw a tantrum. Now that EBA suspension process is official, there are calls for Cambodia to be less dependent on foreign aid and assistance, the reason is so that its sovereignty and independence will not be held hostage by just a few partners. Unfortunately, it is worrying how these authors can continue to deny that Cambodia has already been baited – hook, line and sinker – and has developed an addiction to dependency. It is already over-dependent on two accomplices. 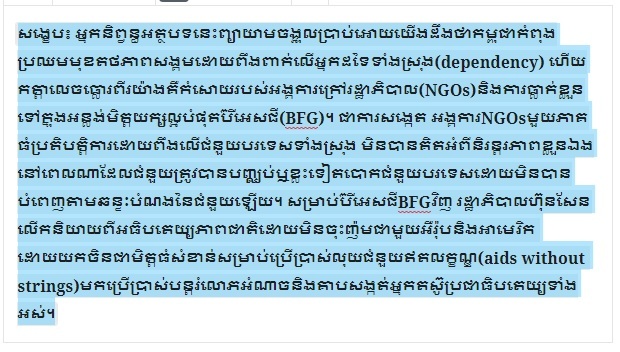 Firstly, non-government organisations in Cambodia. Many NGOs do good work in Cambodia –they provide much-needed services and expertise for Cambodia’s social and economic development, environment, water sanitisation and more. They fill the gaps in Cambodia’s still developing institutions and systems. But it is also true that just as many behave like parasites, using Cambodia as the excuse to prolong their existence. 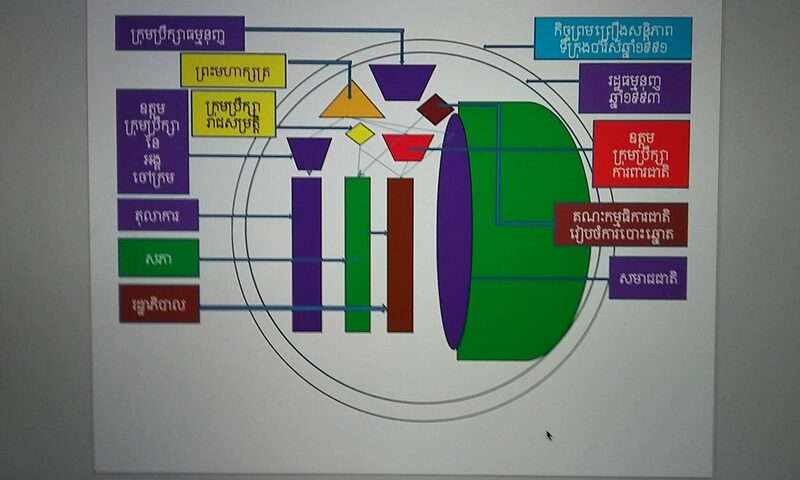 In fact, many are indirectly or directly responsible for breeding dependency in Cambodia. Many do not bother to work together but end up duplicating similar projects or areas of help. It is criminal how some NGOs even encourage ignorant and uneducated villagers to join protests, illegally occupy land and be interviewed for TV documentaries that paint their own country negatively. Unfounded allegations? I know of Cambodians who have bragged about it. So much donor funds have been wasted on short term projects, countless reports and studies, and so many different solutions offered for the country. Each NGO ought to have an exit strategy (and timeline) from Cambodia and to pass on knowledge, skills and expertise. If there is any conspiracy against Cambodia, this is it – not by design but a tragic confluence of selfish agendas. Secondly, Cambodia’s “most trustworthy friend” (or other similar accolades bestowed by the big, friendly giant or “BFG”. BFG has invested massively in Cambodia, particularly in Sihanoukville and across the country. 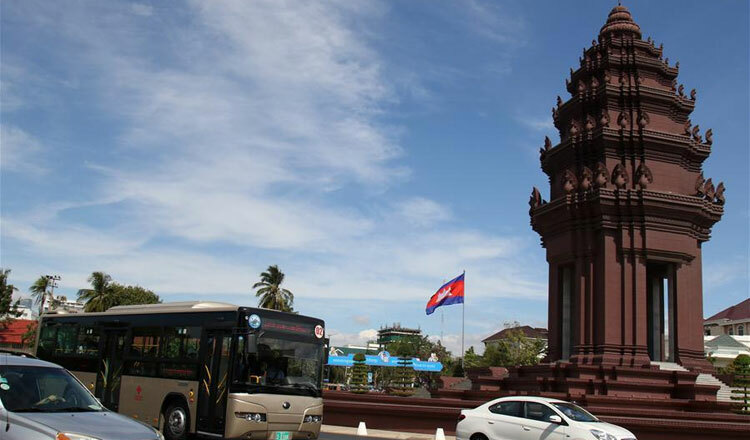 Cambodia has benefited in the form of much-needed infrastructure, better connectivity and higher land values. For Cambodia, the BFG is also a ready and willing source of legitimacy, acceptance and recognition that it cannot get elsewhere. But one must be blind to ignore the negative social impact of BFG’s dominance in the Kingdom. Like this newspaper I suspect it is owned by BFG if this is not published (a challenge and test!). Cambodia runs a huge trade deficit to BFG (Cambodia buys more from BFG than the other way around). Nearly all BFG projects have very little benefit to small business and ordinary Cambodians, and mainly well-connected landowners benefit. The increasing number of BFG businesses and shops in Sihanoukville and the capital cater only to BFG people. Nearly all construction workers in these projects come from BFG (quite a number bring their families, setting up local shops and even local markets), with a small proportion hired locally in low-skilled menial labour work. Most of the supply and construction materials for these projects are imported from BFG. So these projects actually help BFG export their unemployment (sending its construction workers overseas, who would otherwise not be able to find jobs back home), and BFG suppliers and construction companies benefit more than local Cambodian ones. So for BFG grants for projects, the money actually flows back to BFG companies and people.